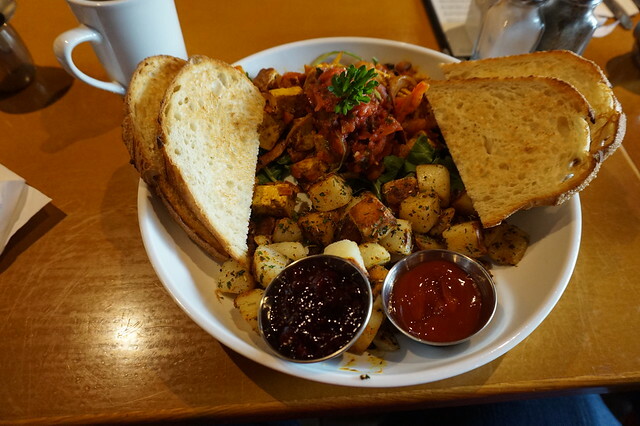 Stella’s For Brunch in Winnipeg – vegan in your city. In Winnipeg and want vegan brunch bright and early? Stella’s has you covered. If you’re a local, or lived in Winnipeg at any point, you’ll recognize Stella’s as an institution in the city. There are locations around the city, they make their own bread, and offer a whole bunch of clearly labelled vegan options – including brunch. So one morning JC and I met up with a friend that recently moved back to Winnipeg from Toronto, over at the Stella’s cafe and bakery location on Sherbrooke. It was busy, but not packed. We got a table near the front and ordered a round of vegan brunch items – well, one of each. There are two vegan breakfast/brunch items on menu over at Stella’s. But also a few more options for other times of the day (but we didn’t try any of those). JC and I shared the Tofu Scramble and the “Vegan Mexican”. Both were great, but I think the Vegan Mexican plate was my favourite. I was glad both plates had seasoned fried potatoes included too because they were delicious. Tofu Scramble – Sautéed seasoned tofu, tomato, onion & red pepper on fresh arugula. Served with salsa, hash browns, with dry sourdough toast & Stella’s jam. 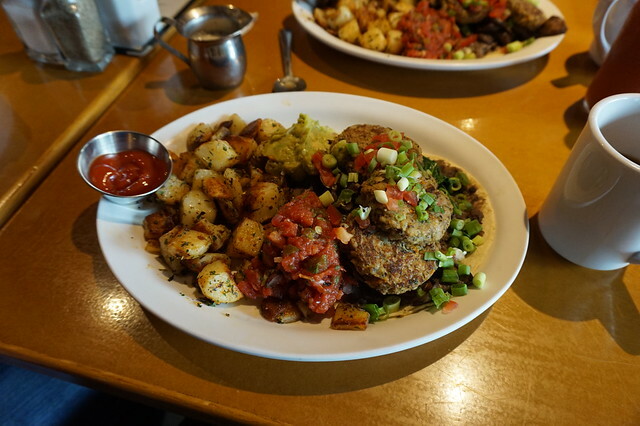 Vegan Mexican – Corn tortillas, refried beans, breakfast patties, spinach, mushrooms, green onion & tomato. Served with salsa, guacamole & hash browns. The thing I liked about this visit, besides the vegan brunch was catching up with a friend, and hanging out at this homey restaurant that felt blended into the community. Plus their endless refill brewed coffee was not bad either. More stories from Winnipeg on Friday. Tomorrow I’m looking forward to collecting a few of my favourite VeganMoFo posts from the last week or so. Vegan brunch sounds amazing! 🙂 So jealous there isn’t a place like that near me!